Accuracy and distance off the tee takes time, technique and lots of practice. In the game of golf, there are few things that rival a long, straight drive in terms of beauty. After all, being able to hammer a ball off the tee right down the middle of the fairway for a short chip to the green is something that every golfer desires. But effective and accurate driving is extremely difficult. 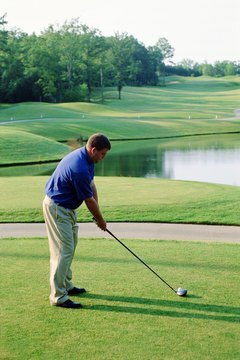 Knowing the basics of an effective drive will allow you to score better and, hopefully, enjoy the game more than ever. Address the ball. You want to make sure that you have a level or upward swing upon impact, so keep the ball set up to the inside of your lead foot. Drop your right hand down off your driver (left hand for left-handed golfers) and bring it back up before swinging. Because the driver is a power club, people tend to back away from the ball, which in turn causes them to open up the club face on impact. If the motion of bringing your hand back up to the club feels natural and you don't have to extend, you're the right distance from the ball. Load up your weight on your back foot in the take away. This will create a powerful transition to your lead foot when you come through impact. Rotate your hips. By the top of your backswing, your hips should have rotated your upper body so that your back is facing the target. Unload on the ball. The tremendous amount of hip rotation and weight transfer on the backswing will allow you reverse it as you come down in to impact. You'll want to wait to break your wrists until the last moment to achieve maximum club head speed. Follow through and release. Immediately following impact, when your club is just two feet off the ground, your back arm should be level with the club, running from the grip to the club head.